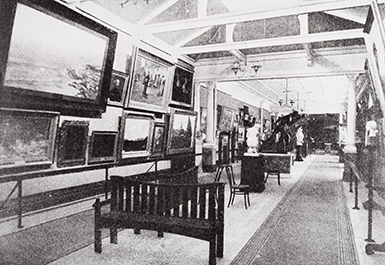 In the late 19th century, Queensland artists Isaac Walter Jenner and R. Godfrey Rivers successfully lobbied for the creation of a state art gallery, which opened as the Queensland National Art Gallery in 1895. 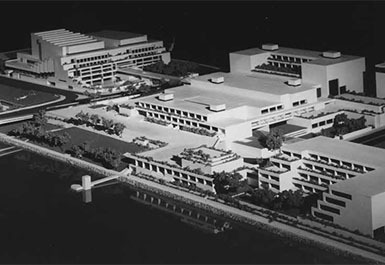 It occupied a series of temporary premises prior to the opening of its permanent home at Brisbane's South Bank in 1982. The establishment of the Asia Pacific Triennial of Contemporary Art (APT) in 1993 forged a focus on artwork of the region, and as an ongoing exhibition series the APT created a case for a second building to display growing contemporary collections. The Gallery of Modern Art opened in 2006, creating a two-campus institution. 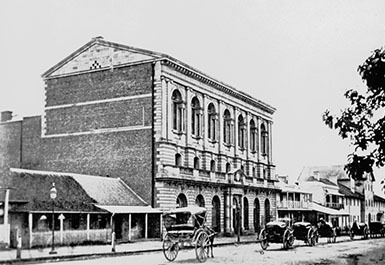 29 March | Queensland National Art Gallery opened by the Queensland Governor, Sir Henry Wylie Norman, at temporary premises in old Town Hall on Queen Street. 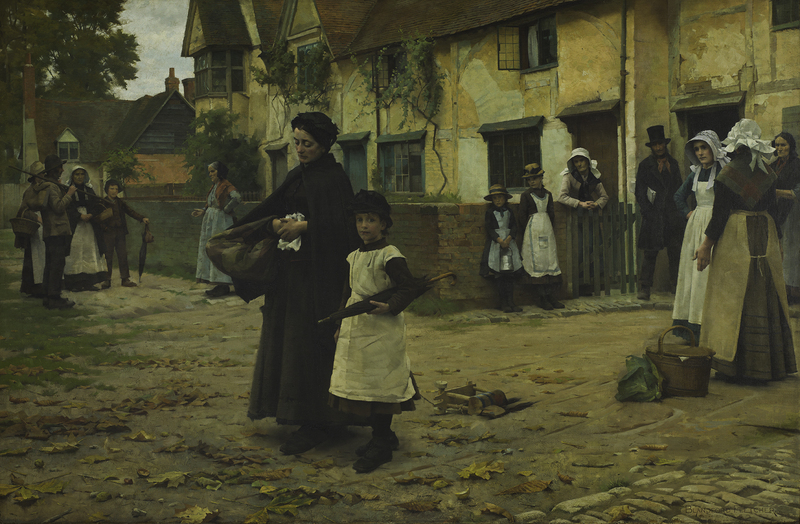 The inaugural display includes 38 pictures, one marble bust, and 70 engravings. Training programs begin for volunteer guides in preparation for the opening of QAG in its new permanent home at South Bank. 21 June | Queensland Art Gallery (QAG) opens in its new permanent home, which is awarded the Sir Zelman Cowen Award for Public Buildings. The Josephine Ulrick and Win Schubert Galleries at QAG are refurbished for a new reimagined presentation of the Australian Collection. James Turrell’s architectural light installation Night Life illuminates GOMA from within from sunset to midnight daily. 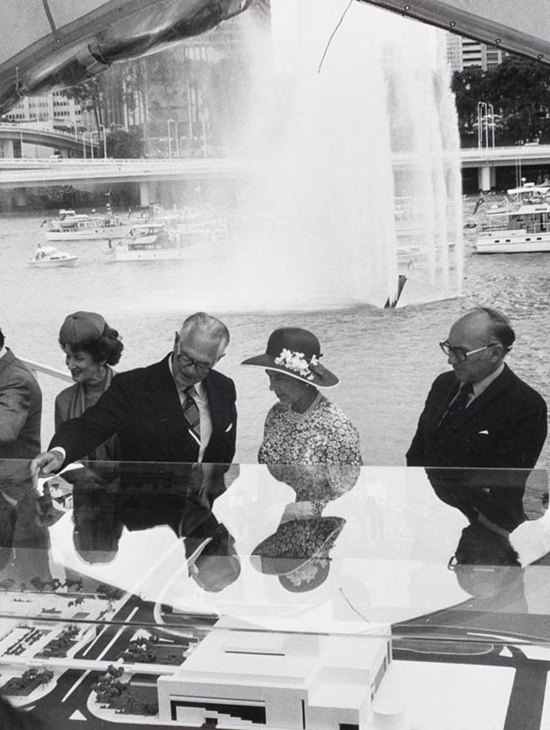 Queen Elizabeth at the Queensland Art Gallery site, 11 March 1977 / Collection: QAGOMA Research Library. 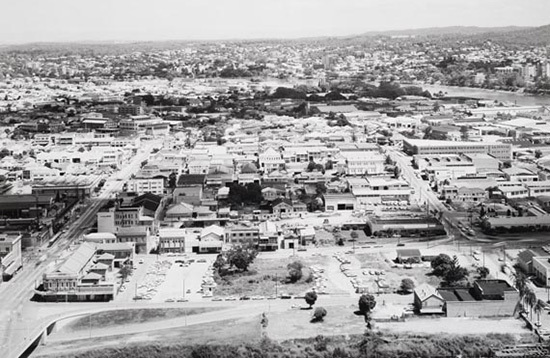 Site for the new Queensland Art Gallery, 16 March 1976 / Collection: QAGOMA Research Library. 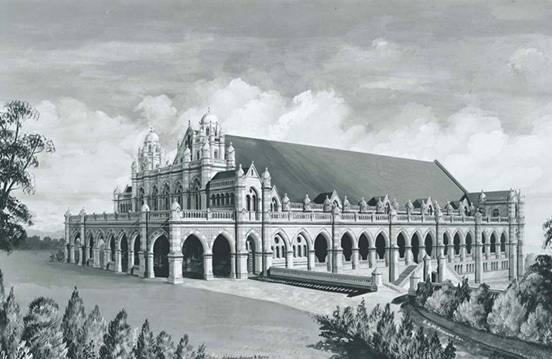 G H M Addison, Australia 1858-1922 / (Architect’s drawing of Exhibition Building, Gregory Terrace) c.1890 / Pen, ink and gouache on light-brown heavy smooth paper / Gift of Herbert S. Macdonald 1958 / Collection: Queensland Art Gallery.